First Impression: Wyoming is one of Cincinnati's best-kept suburban secrets - possibly because of its small size (2.8 square miles and a population of about 8,300), or perhaps because its tight-knit citizenry prefers to keep a good thing quiet. Listed on the National Register of Historic Places and for eight years running designated as a "Tree City USA" for its urban forestry program, Wyoming is a beautiful, safe neighborhood with many amenities of a bigger city while possessing an old-world aesthetic and charm. Second Look: You can walk across the city of Wyoming in less than an hour, but spend all day exploring. Its historic district, which is nationally registered, is comprised of about 300 buildings, many in an ornate Victorian style. Wyoming was established as a village in 1861, right before the Civil War. The community's growth was closely related to transportation; the Miami-Erie Canal opened in 1828, followed by the Cincinnati, Hamilton & Dayton Railroad in 1851, and the streetcar on the Pike in 1900. The train shortened the journey to Cincinnati from a day's trip to an hour, and businessmen who could afford the commute began to move to Wyoming; the village incorporated as a city in 1949. Wyoming remains fairly centrally located, only 15 minutes from Downtown and major shopping districts, and less than 30 minutes from the Cincinnati-Northern Kentucky Airport. Historically, Wyoming was populated by fairly affluent residents, which still holds today; the median family income is around $103,000. 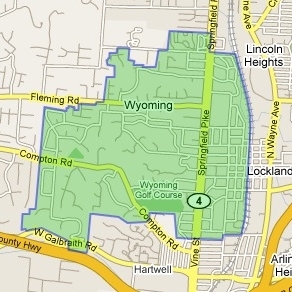 Unlike other suburbs like West Chester and Blue Ash, which are still undergoing explosive expansion, Wyoming's growth is fairly slow; a quiet, residential and historic environment is meticulously maintained, and planning decisions are made carefully by the council as well as an active and well-voiced citizenry. Wyoming has a strong focus on family, offering safe streets and a school system rated by the state as "Excellent with Distinction." It is a peaceful and pleasant neighborhood in which to live or to visit, and especially appealing to those who enjoy strolling among trees and historic scenery.